I don’t think I’m in the minority when I say that I was a little nervous to start my practicum. I had become rather comfortable after four years of classes, seeing the same faces 5 days a week. I think it was Sagmeister who said: “seek discomfort.” That may seem like an odd thing to seek, but with discomfort and change come new opportunities, connections, and learning experiences; All of which expand your mind and add substance to your character. The first day was overwhelming, but I knew that I was in the right place. I had the pleasure of meeting many of the wonderful people around the office and, later, got to volunteer at the Food Bank with the amazing creative team. I spent most of the day settling in and exploring Danica’s extensive server folders and Basecamp discussions. Over the next few days, I sat with each member of the creative team and learned more about their individual role within the company. It was so exciting to hear about the work they got to do each day, and get to know them a little better. Andrea was kind enough to start me out with smaller tasks, such as looking up Pantone colours for a couple of beautiful illustrations and then added more on as the week progressed. I have already learned so much in the short time I have been at Danica, and am excited to continue learning and growing. I feel so lucky to have been placed in such a supportive and encouraging environment. Almost every single person I’ve talked to has said that Danica Imports/Now Designs is the BEST company they’ve ever worked for – and I can see why. There is a sense of family around the office. People aren’t just coworkers, they are friends. There are dogs frolicking, a lovely kitchen area equipped with an espresso machine and fresh organic fruit, and even bootcamp twice a week! I am so happy to be a part of it all. Wow, time is really flying! Week 2 was jam-packed with wonderful projects. I spent most of the week going through the vast client list for Now Designs and converting Adobe Illustrator artwork into JPEGS for a line presentation. These are the kinds of things that I need to learn so it was a great experience. I was a little nervous going into it because I was working with other people’s artwork. I’d open up the file and organize the layers into text or artwork. Then I’d hide the text layer, crop into the artwork, and export as a JPEG. The creative team are a very organized bunch, with good reason! They have so many projects on the go at all times so being organized is a must. When the file was ready I had to mark it with a green dot by holding control and right-clicking on the file, then selecting the green dot under tags. I didn’t know about this function before, and it seems like it will come in handy down the line! The entire studio is moving to a new location on March 16th, so it’s been a little hectic around these parts. There are a lot of people to organize and A LOT of stuff to move. Because the new space is a bit smaller, there has been some major downsizing while I’ve been here. I was put to task with a stack of old pieces of hand done artwork. I learned how to use the scanner, and send the images to my computer. Then I had to work some Photoshopping magic to piece together a few images that were oversized and colour correct everything. Another great thing to learn! I also had the very satisfying job of tearing off Pantone swatches from old colour collection pages and organizing them into piles of “like” colours – oranges and corals, pinks and reds, neutrals and metallics, etc. I should have snapped a photo of my colourful desk! Another project that I really enjoyed working on was the “Welcome to Danica” booklet. There was already a cute little booklet in place, but I was in charge of updating it for the new location. It was nice to put my design skills to work. I got to play with type and layout, and plot little dots on a beautifully illustrated map. All in all, a great learning experience. To finish off the week, I got to do some work for the marketing team. They want to up their Instagram game with some new Instagram Stories. I was let loose on some lovely new products and had fun hiring a hand model to showcase the amazing Empire Swedish dishcloth and mug. This weeks theme was organization. I learned how important it is to put everything in its right place when you are working with a team so that everyone is kept in the know. I love using Basecamp to organize each project and communicate with the team – it is a fantastic tool that I will definitely be using for the rest of my career. I really enjoyed the pace of the week and liked the variety of tasks I was given. Can’t tell you enough how happy I am to be here! How is it week three already? I started Monday morning off with a little more work on the lovely Danica Welcome Package that will be beautifully presented to new-hires in a small package of goodies. The office was quiet, and the morning light was pouring into the lunch room, so I decided to film and style o few more Instagram stories before all of the new items were packed up for the big move next week. I really enjoy taking photographs and styling shoots, so these Insta stories have been a blast. It has also been a good learning experience as I haven’t really played around with the stories before. They are a very useful tool to showcase product in a fun and engaging way. Tuesday was a very exciting day because I was introduced to my first illustration project. 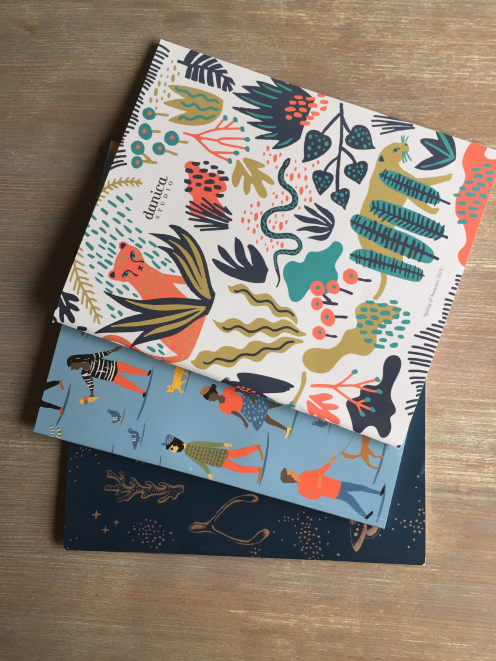 I got to work with Sierra and Caitlin in the key accounts department to develop an illustrated pattern. It’s great to go through the creative process with them because they are an amazing team. I started by researching the company to get a sense of their aesthetic, and then started collecting images for inspiration. I was given the theme “camping,” which really suits my style. After putting together a moodboard, I met with the team to discuss directions and colour schemes. Then it was time to take a break from the computer and sketch the day away. I could get used to this! I started with quick, rough sketches to figure out shapes and get my ideas out quickly. Then started to refine until I was happy with a selection of the drawings. The next step was to scan my sketches and start arranging the little illos in Photoshop. It was super fun to see my sketches evolve over the course of a few hours, from little pencil drawings to crafted, coloured patterns. I did quite a few iterations, playing with different colours and backgrounds. Basecamp was a great place to post these iterations for feedback. It made the process really enjoyable, and cut out the stress of not knowing if something is working or not. By the end of the day, I had created my first pattern. It was such a great feeling, even if it was a small accomplishment in the grand scheme of things. Sierra created some templates that the pattern was to be applied on, so I took my PSD file into Illustrator and proceeded to play around. I learned that it really helps to have every illustration on a separate layer in Photoshop before transferring it over to Illustrator for ease of arranging objects and making small adjustments here and there. Overall, it was another wonderful week! I started out the week with some sorting and organizing of dielines, care tags and prototypes for the senior packaging designer. It was amazing to see all the work, care and detail that goes into designing each piece. Christie does an amazing job of organizing lots of information in a very small space. Next on the to-do list was to tackle my latest camping pattern project. I spent most of the day moving objects around my Illustrator artboard trying to get the spacing just right. Then creating the pattern using grids and alignment techniques and saving it as a swatch. Then the really fun part – application! I was provided with some more templates to apply my pattern to. I love seeing it all come together on various products! After some great feedback from the team, I had to go back to square one to fix some minor things. Unfortunately, there is no efficient way to make small adjustments after the pattern has been created, but I didn’t mind because I really enjoy the process. Much of this week was spent working with the key accounts team on pattern creation and application – which I’m really loving. Starting next week, I will be working on a new Easter-themed pattern. Very excited to go through the creative process of gathering inspiration, sketching and ideating, creating the pattern and applying it to templates. 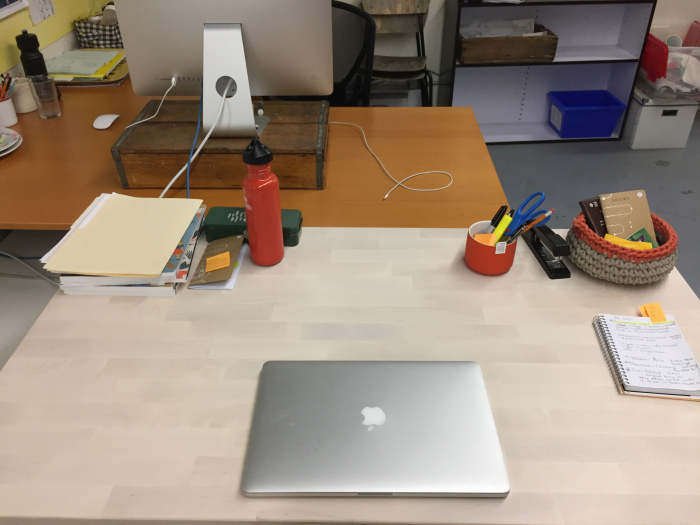 This was the last week before the massive move to the shiny new office, so there were many spurts of cleaning and organizing – real world stuff. And I don’t mind moving around and seeing all of the amazing products that have been created over the years. I’ve said it in a previous post, but I am continuing to learn the importance of organization within a business. It is crucial for anything to get done, and get done well. One of the most exciting things I did this week was to sit in on a big packaging design meeting. It was almost 3 hours long! We covered many exciting topics and talked through any issues that may have arisen regarding new products, packaging malfunctions and new designs for product boxes and tags, to name a few. It was really fun watching and listening and engaging in the ideation and conversation. I think I was a good addition to the meeting because I was seeing things with fresh eyes, and thus bringing a new perspective to the table. I finished off the week helping set up the beautiful new office with a small team of lovely ladies and a few burly men. Very excited to start work there on Monday morning!